This is a version of the traditional raised pie that graced the sideboards of many a rich household going back centuries. With much time being devoted to celebrating the festive season, the amount of time spent waiting on the kitchen could be drastically reduced with a sideboard groaning under selection of cold cuts and pies to slice throughout the twelve days of Christmas. The most famous Christmas pies were undoubtedly from Yorkshire, whose frequently gargantuan sizes inspired both awe and wonder, not to mention expense. Adapted from his book The Cook’s Guide and Housekeeper’s & Butler’s Assistant, Francatelli’s recipe simplifies the difficulty of baking so many different types of game and poultry from raw, by pre-cooking the birds to medium rare, filling the pie with the meat, and then finishing the cooking when the pie is baked. The baking time is also considerably reduced. This recipe has a lot of steps, none of which are particularly difficult, but you can spread them out over a couple of days rather than feel obliged to have one mammoth kitchen session. 1 large egg for glazing. Set aside 1 tablespoon of the seasoning mixture for use on the filling. Melt the butter for the forcemeat in a large pan with the chopped garlic. Add the chopped bacon and cook for 5-10 minutes. Add the chicken livers and sprinkle with the seasoning mixture. Cook until just pink in the middle. Remove from the heat and tip into a food processor fitting with a chopping blade. Blitz until smooth, pour into a bowl, cover and set aside until required. Season the game birds with salt, pepper, and the tablespoon of the seasoning mix. Spread with a thin layer of the forcemeat. Arrange in a baking tray and brush over with melted clarified butter. Bake until just cooked through (internal temperature of 74°C). If using crowns or whole birds remove the breasts, as whole as possible, from the carcass and strip the rest of the meat from the bones. Allow to cool completely then cover and chill in the fridge until needed. Put the remnants of the carcasses into a large pan, together with the stocks, seasonings and vegetables for the savoury jelly. hours to allow the flavours to develop. Strain the stock twice: once through a fine sieve and then again through dampened muslin to remove all the unwanted solids. Allow the stock to cool, then chill in the fridge. Remove the fat from the surface of the chilled stock and decant the stock into suitable containers. then little or no gelatine will be required, if it is a soft-set, then just half the regular quantity of gelatine may be all that is required. Cut off about 1/3 of the pastry and roll out for the lid of the pie. Cut it to size with 2cm extra all round. Cover with cling film and set aside. to support a lot of filling – no less than 1cm on the sides and a little thicker over the bottom half of the pie. Let any excess pastry lie over the edges of the tin. 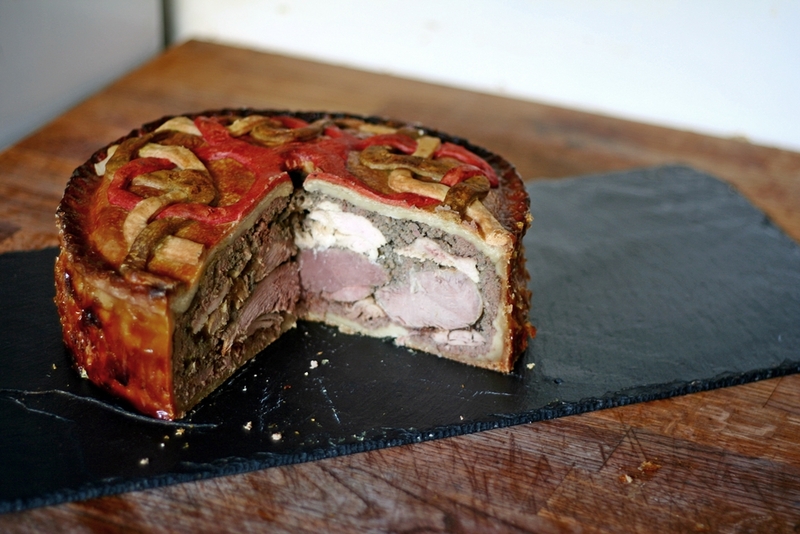 Spread a 1cm layer of forcemeat all over the inside of the pie. Arrange a layer of the meat and cover with a layer of forcemeat to fill in any gaps. Continue layering until all the filling and forcemeat has been used up. Brush the top edges of the pastry with water. Lay the pie lid over the top of the pie. Press firmly around the edges to seal. Trim any excess pastry using the back of a knife, then crimp the edges of the pie to decorate. Use the trimmings to make decorations for the top of the pie. Cut a 1-2cm steam vent in the top of the pie, large enough for the savoury jelly to be poured through once the pie is baked. Brush the lid of the pie with beaten egg and bake for 1 hour and 15 minutes, or until the internal temperature reaches 70°C. If the top starts browning too much, cover loosely with a sheet of baking parchment or foil. Remove from the oven and set aside to cool for several hours. When almost cold, measure out 600ml of the savoury jelly and warm in a pan. If using gelatine, soak as many leaves as required in cold water before draining and adding to the stock. Stir until the gelatine has melted. Before you start pouring the savoury jelly into the pie, you might want to check whether there are any holes in your pastry. Carefully remove the pie from the tin and inspect closely. You can either mix up a flower and water paste to fill any cracks, or wrap the sides and bottom of the pie tightly in cling film: this won’t stop the leaks, but it will keep everything contained until the jelly has set. Return the wrapped pie to the tin before adding the jelly. Pour the jelly a little at a time through the hole in the top of the pie. Use a jug and/or a fine funnel. Allow time between pourings for the liquid to permeate the pie filling – it has to find and fill all the air pockets between the meat. Leave to set in a cool place, or, if you have room, in the fridge overnight. The jelly will seal off any air pockets and thus prolong the shelf-life of the pie. Properly stored, it can adorn a sideboard buffet all the way from Christmas almost to the New Year. 1 “Local and General Intelligence”, The Northern Star and Leeds General Advertiser (Leeds, England), Saturday, January 7, 1843; Issue 269. p3.